(Singing…) The weather outside is frightful, but desserts are so delightful, and since we’ve no place to go… let us eat, let us munch, let us snack. The Cookie Monster has arrived with the cold Northern wind. I’m not sure when he got here but he’s sleeping in my kitchen, and he brought gifts: cookies, pies, homemade candies and brittles. I didn’t ask for any of this, in fact, I didn’t ask him to stay at all. But here we are. Does anyone else feel like this? Once it gets cold and the holidays come into full swing, there are sweets EVERYWHERE. It’s like the Cookie Monster is sitting on my shoulder munching away, stashing crumbs in my cowl neck sweater. Especially if you work in an office, everyone brings a ‘treat’ to share and you love them for it. You also hate them for it. 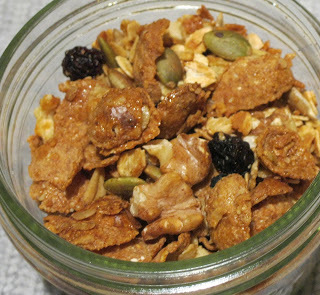 Foodie Note: Use whatever flakes you like, I prefer something uber healthy and filling, like Nature’s Path Heritage Flakes. The bulk of the flakes makes it look like more is in your bowl. Fiber fills you up and regulates blood sugar. Also, I used all raw nuts and toasted my own in batches. 1) Preheat oven to 275 degrees F. Warm a dry skillet to medium low, toast sunflower seeds until the color begins to golden and they become fragrant. Work in batches to toast the pepitas and walnuts. Once the walnuts are cool enough to touch, roughly crumble with your hands. Pour into a greased 9×11″ baking dish. 2) Add oats, olive oil, honey, maple syrup and salt to nut mixture. Mix thoroughly. Add bran flakes and stir gently into oat mixture. 3) Bake uncovered for 45 minutes. Stir, bake an additional 45 minutes. 4) Turn oven off. 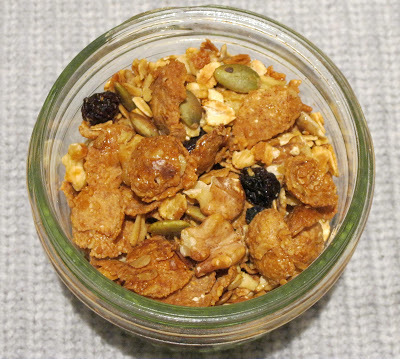 Take granola out, add raisins and blueberries, stir into mixture, put back into the warm oven for 10 minutes. Remove from oven, let cool, store in airtight container. Thanks Mary! I'm embarrassed to say how long this batch lasted… I might love granola TOO much. Loved seeing you on TV! Look out Food Network!